1883 in History Chester A. Arthur is President; the Brooklyn Bridge is completed after 14 years of work; Life magazine is published for the ﬁrst time; the ﬁrst vaudeville show opens in Boston; Edison produces the ﬁrst electric lighting with overhead wires in New York. 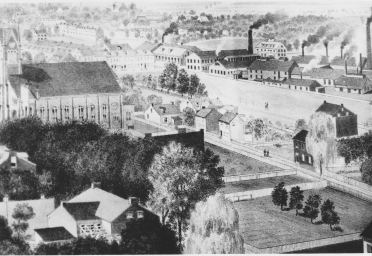 Artist's perception (ink drawing, 1880) facing northwest as seen from a no-longer-existing 110-foot tower at Lancaster County Prison on East King St. Factories brought many people to the city. Rolling Mill Railroad Equipment Co. (compound of buildings with smokestacks) was located at the corner of West Walnut and North Plum Streets. 1883 at St. Anthony’s Fr. Kaul’s father, Pirmin Kaul, dies, leaving him a sizable bequest. The pastor uses the money to invest in real estate, including the purchase of several houses on Marion Street behind the rectory. These he sells to parishioners for a reasonable price. They are still in use. Fr. Kaul’s interest in Lancaster development has included negotiating on behalf of the Sisters of St. Francis from Philadelphia to acquire the land and buildings for St. Joseph’s Hospital. 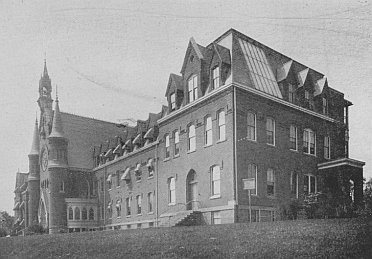 Constructed in 1877, the original hospital was designed by Edward F. Durang, the same man who planned both St. Anthony’s Church and Sacred Heart Academy. With the help of several influential parishioners, the Sisters ﬁnally take possession of the hospital property on August 23, 1883. They pay $26,500.00 for it. Photograph of St. Joseph's Hospital as it appeared in 1883. Lancaster Regional Medical Center occupies the site. 1893 at St. Anthony’s Rev. Anthony Kaul is appointed Dean of the Lancaster and York Diocesan School Boards. Alterations begin on the church property, including installing concrete pavements around the church. Side pews are installed in the upper church. In December of 1893, Fr. Kaul convenes a meeting of Catholic representatives from all over Lancaster to discuss his plans to erect a new building on parish grounds. It would house the school as well as facilities for social, recreational, and educational projects for the whole parish and would include an auditorium. The building would be called the Catholic Institute. The architect would again be Edwin F. Durang of Philadelphia. Preparations also begin to celebrate Fr. 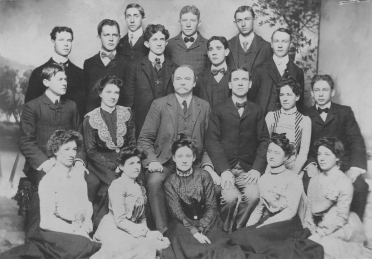 Kaul’s 25th anniversary of ordination in 1894. 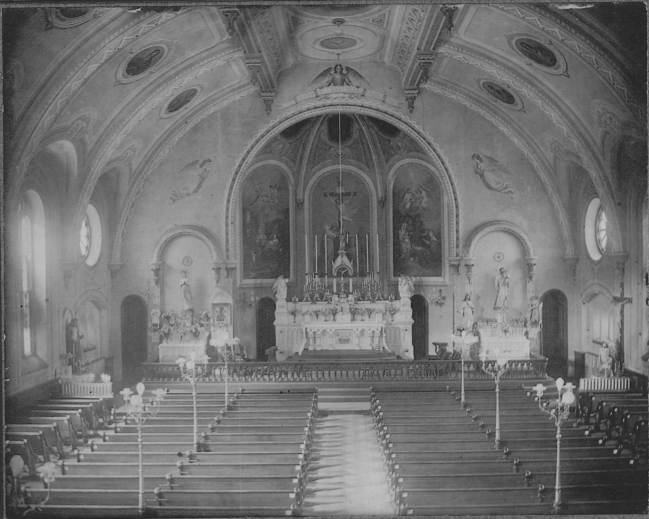 Church interior ca. 1893. Side pews have been added, note the gas light standards in the pews. The baptistry (west side) and St. Anthony shrine (east side) have not been added at this time. Some of the treasured items pictured have been lost or are unaccounted for. Many are still in our possession, notably (from left to right): the pews and communion rail are used in the lower church, the St. Anthony statue (front left side), Blessed Mother statue, Our Mother of Perpetual Help icon (right of BVM), Sacred Heart of Jesus statue (left of St. Joseph statue), Guardian Angel statue (right of St. Joseph), large crucifix (far right wall), and the Pieta statue at the base of the crucifix. Though not all listed items are seen in the church today, they are part of our vast archive. 1903 in History Theodore Roosevelt is President following McKinley’s assassination in 1901. (Since he was 42 when he assumed office, T.R. remains our youngest president.) The Wright Brothers make aviation history at Kitty Hawk; Pierre and Marie Curie are awarded the Nobel Prize in physics; the treaty is signed by the US and Colombia to begin digging the Panama Canal. Fourth row: Oscar Smith, Harry Siefert, and John Drachbar. 1903 at St. Anthony’s Assistant priests are Rev. John Melchior and Rev. Augustine Kappes. Fr. Kaul has just returned from Europe after consulting physicians there about his detached retina. This is the beginning of his eye problems. Parishioners are getting used to the new electric lights installed in the church where the gas light standards used to be. On April 19, the first Communion class of 63 children is entertained in the rectory for breakfast, which will become a custom with Fr. Kaul. Meanwhile, the young people of the parish enjoy participating in the Lyceum Club, formed to engage both men and women in activities not only social but educational. They meet in the Parish Institute building, erected in 1895 as a school and parish center. 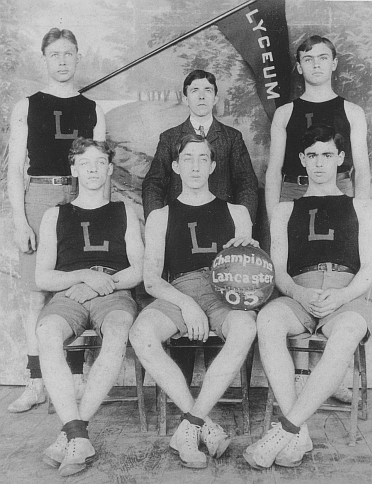 With a new interest in sports, a basketball court is installed on the basement floor during the winter of 1902–03, with the sidelines parallel to Orange Street. Players dodge around the big post in the middle of the floor. The baseball team is also very active and plays in the PA State Legion Park at the northeast corner of King and Parkside Avenues.